Although the term granular activated carbon is used generically, it can refer to dozens of similar – but not identical- adsorbents. Depending on raw material, method and degree of activation and other factors, activated carbons can perform differently in various applications. TIGG Corporation has more than 40 years of experience in activated carbon market development, product development, research and applications technology. 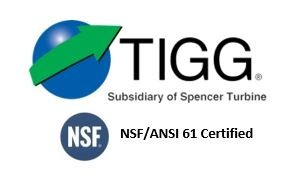 As a leading manufacturer of liquid phase and vapor phase activated carbon adsorption equipment, it is in TIGG’s interest that prospects have a means for assessing the characteristics of activated carbon adsorbents they may be considering. This will allow clients to acquire a pre-engineered adsorber with the optimum adsorbent contents. Within constraints of brevity, this commentary is designed to objectively summarize key selection criteria. Granular Activated Carbons are a very versatile group of adsorbents, with capability for selectively adsorbing thousands of organic, and certain in- organic, materials. From medicinal uses of powdered carbons in ancient Egypt, through charred interiors of whiskey barrels, carbon has been activated and used as an adsorbent for centuries. Granular vapor phase activated carbon media was first widely used in WWI military gas masks and, in the years between World Wars, commercially in solvent recovery systems. Since adsorption is a comparatively specialized technology, a capsule definition of terms may be helpful. Adsorption is a surface phenomenon, in which molecules of adsorbate are attracted and held to the surface of an adsorbent until an equilibrium is reached between adsorbed molecules and those still freely distributed in the carrying gas or liquid. While the atoms within the structure of the adsorbent are attracted in all directions relatively equally, the atoms at the surface exhibit an imbalanced attractive force which the adsorbate molecules help to satisfy. Adsorption can then be understood to occur at any surface, such as window glass or a table top. The characteristic which typifies an adsorbent is the presence of a great amount of surface area; normally via the wall area or slots, capillaries or pores permeating its structure, in a very small volume and unit weight. The type of adsorption which is dependent primarily on surface attraction, in which factors such as system temperature, pressure, or impurity concentration may shift the adsorption equilibrium, is given the further classification of physical adsorption. The electronic forces (Van der Waal’s forces) responsible for adsorption are related to those which cause like molecules to bind together, producing the phenomena of condensation and surface tension. Conceptually, some prefer the analogy of physical adsorption being like iron particles attracted to, and held by, a magnet. Physical adsorption is the most commonly applied type, but an important sub-classification is chemisorption. Chemisorption refers to a chemical reaction between the adsorbate and the adsorbent , or often reaction with a reagent which may be impregnated on the extensive adsorbent surface (see Impregnated Carbons, below). Thus physical adsorption/desorption retains the chemical nature of the adsorbate, while chemisorption alters it. The surface phenomenon of adsorption may now be contrasted with apsorption, in which one material intermingles with the physical structure of the other; for example, phenol dissolving into fibers of cellulose acetate (absorption) versus being adhered by surface attraction to the outer layer of the fibers (adsorption). Granular Activated Carbon (activated charcoal) is an adsorbent derived from carbonaceous raw material, in which thermal or chemical means have been used to remove most of the volatile non-carbon constituents and a portion of the original carbon content, yielding a structure with high surface area. The resulting carbon structure may be a relatively regular network of carbon atoms derived from the cellular arrangement of the raw material, or it may be an irregular mass of crystallite platelets, but in either event the structure will be laced with openings to appear, under electron micrographic magnification, as a sponge like structure. The carbon surface is characteristically non-polar, that is, it is essentially electrically neutral. This non-polarity gives the activated carbon surface high affinity for comparatively non-polar adsorbates, including most organics. As an adsorbent, activated carbon is this respect contrasts with polar desiccating adsorbents such as silica gel and activated alumina. Granular Activated carbon will show limited affinity for water via capillary condensation, but not the surface attraction for water of a desiccant. Activity level is often expressed as total surface area per unit weight, usually in square meters per gram. This total exposed surface will typically be in the range of 600-1200 m2/g. Toward the higher end of this range, one might better visualize one pound, about a quart in volume, of granular activated carbon with a total surface area of 125 acres. To be useful in adsorption, surface area must be present in openings large enough to admit the adsorbate molecule(s). To provide some guidance on this topic, and for quality control purposes, the carbon industry has developed additional standardized vapor and liquid adsorption tests, using adsorbates of varying molecular size and chemical nature such as iodine, phenol, methylene blue, carbon tetrachloride, benzene and the color in standard black strap molasses. However activity level is measured, it is most meaningful when considered with additional characteristics described in the following sections. While openings into the carbon structure may be of various shapes, the term “pore,” implying a cylindrical opening, is widely used. A description of the minute distances between walls of these pores, normally expressed as a function of the total surface area or total pore volume presented by pores of various “diameters,” is the pore structure curve. The following sketches show some sample pore structure curves and what approximate pore shapes are described by the curves. Please note that the average pore shape depicted is derived from a summation of pores of various sizes and shapes. Thus no pore within the activated carbon is likely to have precisely the average shape, but the granular activated carbon overall will often perform as if all its surface area were in pores of that shape. The smallest diameter pores make up the micropore structure, and are the highest adsorption energy sites. Microporosity is helpful in adsorbing lower molecular weight, lower boiling point organic vapors, as well as in removing trace organics in water to non-detectable levels. Larger pore openings make up the macroporosity, which is useful in adsorbing very large molecules and aggregates of molecules, such as “color bodies” in raw sugar solutions. Another important function of the macropore structure is in assisting diffusion of fluids to adsorption sites in the interior of the carbon particle. Given the above, pore structure. (1) would be effective in adsorbing high volatility solvents, for certain types of odor control, and in removing trace organics from water; the latter with the liability of marginal diffusion characteristics. Pore structures along the lines of. (2) offer a good balance of selectivity for molecules of various sizes, ability to reduce vaporous and liquid contamination to ultra low levels, and good diffusion characteristics. Structure (3) would allow excellent diffusion and can accommodate very large molecular sizes, but has little micro- pore structure and would have very poor retentivity for most organics. 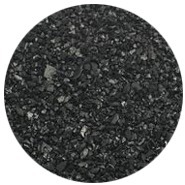 Granular activated carbon can be produced from various carbonaceous raw materials, each of which will impart typical qualities to the finished pro-duct. Commercial grades are normally prepared from coconut and other nut shells, bituminous and lignite coals, petroleum coke, and sawdust, bark and Other wood products. In general, nut shells and petroleum cokes will produce very hard carbons with a pore structure characterized by. (1) above, coals a (2) type structure in comparatively hard carbons, and wood (3) structure in carbons lacking great crush and abrasion resistance. It should be emphasized that specific production techniques may yield carbons that depart from the norm of a given raw material. The solid, or skeletal, density of most activated carbons will range between 2.0-2.1 g/cc, or about 125-130 lbs/cubic foot. However, this would describe a material with essentially no surface area and no adsorptive capacity. For GAC, a much more practical density is the apparent density (A.D.), or mass of a given volume of adsorbent particles. This density will be significantly lower than the solid density, due to the presence of pores within particles, and void space between particles. In most commercial GACs, the A.D. variation is between 0.4- 0.5 g/cc, or between 25-31 lbs/cubic foot. Since granular activated carbons are used in adsorbers of fixed volume, apparent density values can be used to calculate volume activity, which may help determine the work capacity of an adsorber with alternative carbon loadings. For example, assume that carbon A adsorbs iodine to produce a standardized Iodine Number of 1100 mg/g., and has an A.D. of 0.4 g/cc Carbon B has an Iodine Number of 950 mg/g and an A.D. of 0.5 g/cc. Multiplying the A.D. by the weight basis activity value, carbon A has a volume iodine capacity of 440 mg/cc while carbon B has a value of 475 mg/cc. Therefore, carbon B, which has lower activity, might actually do more work and therefore have a longer service life than carbon A of an equal volume. If the price of carbon B permitted filling a given adsorber with the greater weight required, it could thus be the most economical of these adsorbents on a net cost basis. Since standard activity tests are run with oven dried carbon, it will be immediately apparent why high A.D. values that reflect added moisture will not produce the benefit illustrated above. Similarly, high densities due to significantly low activity levels, or ash or inactive char residue from reactivation, or any non-carbon adulterants will not normally benefit service life nor the adsorbent’s capability to produce highly purified fluids. The size of most granular activated carbons is given by the U.S. Sieve range that will include the majority of the particles in a distribution of sizes. Typically the range will cover 85-95% of the total product, with a few percent slightly larger and smaller sizes permitted by specification. A similar approach is occasionally used with Tyler Screen or other screen sizes. Pelletized carbon, although not truly granular, often is described by the sieve range method, or by diameter of the pellets. Since impurity removal requires the diffusion of adsorbate into the intra particle structure, the rate of adsorption will increase as the particle size decreases. As fluid flows through an adsorber, increased rate of adsorption will require less adsorbent bed depth and contact time for the region in which the adsorbate is being removed. This functional adsorption region is termed the adsorption wave front or ~ transfer zone. However, with any given fluid, decreasing particle size carries the liability of increasing flow resistance or pressure drop. In practice, particle sizes are selected to produce a reasonable balance between the competitive benefits of rapid rate of adsorption and effective removal, versus the liabilities of increased flow resistance and attendant higher pumping costs. Hardness and abrasion resistance are generally beneficial in all granular activated carbons, although their operational usefulness can vary greatly. Within common adsorber designs and operating ranges, all commercial granular activated carbons can withstand their own weight and the pressure effects induced by fluid flow. Thus in systems in which the granular activated carbons will be used once or handled very infrequently, hardness characteristics may be of little or no import. Conversely, if the carbon will be subject to frequent handling for a regeneration step, is subjected to thermal excursions by regeneration in place, or must resist excessive vibration, hardness may become quite important. For example, fines (dust) from handling a soft carbon in a system using thermal reactivation may double or treble the losses in the reactivation furnace itself. In solvent recovery systems using steaming cycles for regeneration, carbons that fracture easily can frequently raise pressure drop enough to require that the adsorbent be re-screened and replenished, or replaced. In evaluating hardness numbers, it should be remembered that the granular activated carbons hardness test has no relation to the hardness scales used for plastics, metals or minerals. A carbon, of 98 hardness, is appreciably harder than one of 80, but even harder materials such as diamond, steel and copper, even though they differ in actual hardness, will all report as 100 on the basis of the granular activated carbons hardness test. If part of the carbon raw material, ash generally varies between 2-20 weight percent in commercial granular activated carbons. A portion of total ash may be water-soluble, normally a greater amount acid soluble, and the remainder deeper within the skeletal structure of the carbon to be effectively insoluble. Ash from wood and nut shell carbons tends to be rich in alkaline metals, while that from coal largely oxides of aluminum, silicon and iron. For the limited instances in which traces of soluble or reactive ash are objectionable, granular activated carbons pre-washed with water or acids are available, or grades based on certain raw materials may minimize the total ash level or particular ash components. Natural ash is normally not detrimental to the adsorption process, and standard activity tests report granular activated carbons efficiency including the weight of the ash. However, in certain regenerated granular activated carbons, ash that is a residue of previous uses may block some or all of the micropore structure that is vital for removing organics to ultra low levels. Similarly, if ash is due to previous impregnation for another use, or due to any other adulterant, the carbon performance may be seriously compromised. Water extracts of activated carbons are used for reporting pH. Untreated coal base carbons are typically close to neutrality, while nutshell and wood carbons are more alkaline. Most untreated GACs vary between pH 6-10, but added acids or alkalis may further extend this range. In purifying water and aqueous solutions, the pH of the granular activated carbons should be contrasted with the preferred pH of the solution. Most organics are best adsorbed from slightly acid, pH 5-7, solution. However, the beginning pH of the GAC will not influence the pH of the treated solution very long (although adsorbates being removed may alter solution pH). High surface area per unit weight or volume can make granular activated carbon an effective substrate for dispensing other materials in a manageable form. Impregnants may be catalysts, or they might be reactive chemicals added to improve the rate of adsorption, selectivity, or capacity for certain adsorbates. Examples of the latter would include carbons with a faster rate of removal for hydrogen sulfide and other acid gases, some with capability to remove ammonia and lighter amines, and some with enhanced capacity for reduction of mercury vapor. Impregnated carbons usually retain 75% or more of the physical adsorption capability of the base carbon, so they are often used for combined physical adsorption and chemisorption. Whether an impregnated granular activated carbon will be cost effective frequently depends on whether a particular adsorbate is the only, or primary, removal candidate. As explained earlier, carbon activation is frequently carried out in high temperature furnaces, under mildly oxidizing conditions. As the name implies, reactivation refers to using a similar process to volatilize and oxidize the adsorbates on spent carbons. The term reactivation might be contrasted with re-Qeneration, which refers to steaming or other methods to restore a portion of the GAC adsorptive capacity, al- though the terms are commonly interchanged. Reactivation will almost always produce measurable changes in pore structure, due to additional oxidative sculpturing of the carbon surface and, frequently, deposits of residual chars or inorganic materials. In a few cases, reactivated granular activated carbons perform better than or as well as the virgin material, but in many others there may be a defined loss of comparative efficiency or a gradually increasing loss of efficiency. When loss of efficiency is encountered, it is normally most pronounced in the micropore structure, therefore it is most significant operationally when the last traces of contamination must be removed. Dedicated reactivation, in which a granular activated carbon will be segregated and returned to the same use, tends to be more predictable than employing a reactivated GAC from a different previous use, or a mixture of reactivated granular activated carbons from a variety of previous uses. However, dedicated re- activation is impractical for spent GAC quantities under several tons. The cost effectiveness of reactivated versus virgin carbons can be understood to vary with the performance requirements, the comparative volume service life, and the volume cost of the material (cost per unit weight may be misleading, as reactivated carbons frequently have higher apparent densities). Given the possible variations in reactivated carbons, it will also be understood that a reputable supplier should always specify if virgin or reactivated GAC is being offered. Granular activated carbons quality and uniformity will fundamentally relate to characteristics involving: (1) adsorption capacity and (2) a physical description of the product. The activated carbon industry, often in cooperation with A.S.T.M. and other standards organizations, has developed a series of tests that measure these characteristics. As would be expected, such tests can be used both as production controls and, as published specifications, assurance for prospective buyers. Not all granular activated carbons manufacturers and distributors publish adsorption specifications. Among those that adhere to specifications, the same precise group of tests may not be used. However, some correlation of values is usually possible as, for example, between the vapor phase carbon tetrachloride test used in the U.S. and the benzene and acetone tests more common in Europe and the Far East. Among physical tests, the methods to determine moisture, apparent density and particle size or distribution are relatively standard among manufacturers. Hardness or abrasion values may require some interpretation or correlation, as above. Terms such as “high quality; excellent adsorption characteristics; hard; dense; etc.” are inadequate substitutes for specifications. They offer no guidance for comparison, no assurance of quality, and no confidence of uniformity. Many prospective granular activated carbon users will be considering applications that are unique to some extent. Perhaps the mix of impurities is unusual, or the system conditions or performance required may be new. The uncertainty of these situations has historically been resolved by testing. More recently, vapor and liquid computer-assisted correlative techniques have been developed for use when urgency, lack of test fluids, or costs make tests impractical; or to help establish test protocols that will yield the most useful information. A description of TIGG Corporation’s Adsorption Predictive Technique (APTTM) computer service is available on request. Experimental granular activated carbons tests include adsorption isotherms and column tests. Isotherms are batch tests which require careful evaluation before eventual GAC performance in continuous adsorbers may be predicted. Column tests may vary from laboratory bench to pilot or semi- commercial scale. Sometimes results of such test are termed “treat-ability studies,” and many useful results have been published. Unfortunately, some published data do not describe the methodology or adsorbents used; others employ test methods or data interpretations that are suspect. Therefore the literature can be a risky basis for determining GAC efficiency, although tests performed and interpreted properly are quite dependable. Major GAC manufacturers, as well as firms such as TIGG Corporation which specialize in GAC equipment, can recommend test procedures and may have small scale adsorbers available. A very important evaluation caveat is that different GACs have differing efficiencies for different applications. Thus a test, literature search or computer projection based on a particular GAC will not necessarily describe the performance to be anticipated from another GAC. Readers will appreciate that, while not to be ignored, granular activated carbons price is rarely the leading factor in selecting an adsorbent. GACs of diverse efficiencies, qualities, sources and prices are in the marketplace. Price per pound or per cubic foot should be interpreted in terms of effectiveness. Cost effectiveness, in turn, may relate both to the GAC and the adsorber in which it will be applied, since even the optimum GAC will not overcome a deficient adsorber design. We hope that some of the commentary in this guide will assist in selection of the most cost effective adsorbent. An overriding factor in outlining the proper granular activated carbons to use, and predicting expected results, is the clearest possible definition of the application. Eventual performance typically reflects the quality of information used for initial technical judgments, and selecting a GAC follows this truism. Click here for more information on TIGG’s line of activated carbon and other types of filtration media or call us at 1-724-703-3020. Click here to download this article, Granular Activated Carbon (GAC) Media Selection.